£30 including 3 course dinner and welcome drinks. All proceeds to The Labour Party. Stockwell Labour Party, in partnership with the Portuguese community are holding a fundraising dinner on 7th April. The dinner should be a great chance to get to know some of your neighbours and enjoy some tasty Portuguese food. Stephen Twigg and Val Shawcross, the Labour Assembly Member for Lambeth & Southwark will be the guest speakers. There will be a raffle with rare political memorabilia to win, so it promises to be an entertaining evening. 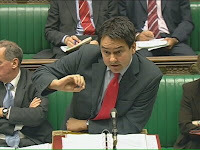 Stephen Twigg is the former MP for Enfield Southgate, who famously beat Michael Portillo in th 1997 General Election. He was an Education Minister until 2005, when he became Director of the Foreign Policy Centre think tank. He is currently the Parliamentary Candidate for Liverpool West Derby. £30 Quid to meet a Labour twigg? On current form I might manage to vote for Kate Hoey but I wouldn't even shell out £30 to meet Labour's whole Brown tree. And certainly not to meet the 3 local Ward musketeers - one or other of 'em will roll-up on the knocker at local election time - at other times its pretty well studied radio silence. er.... please book asap as the seats will all go like lightening and to avoid disappointment. Ticket sales end Christmas eve 2009.